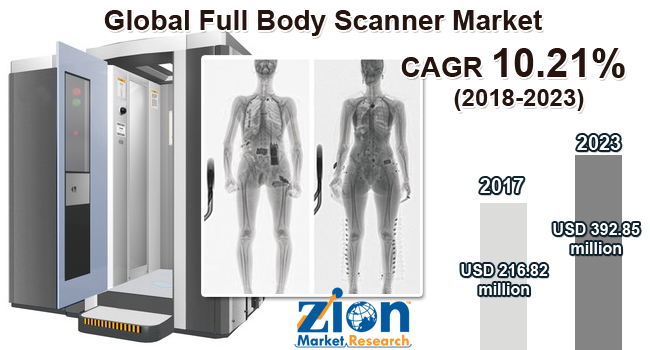 Global full body scanner market expected to reach around USD 392.85 million by 2023, at a CAGR approximately 10.21% for the forecast period from 2018 to 2023. A full-body scanner is a device used to detect objects on a person’s body without any physical contact for security screening purpose. The report gives a transparent view on the full body scanner market. We have included a detailed competitive scenario and portfolio of prominent vendor’s operative in full body scanner market. To understand the competitive landscape of full body scanner market, an analysis of Porter’s Five Forces model for the market has also been included. The report offer market attractiveness analysis, wherein technology, systems, applications, and regional segments are benchmarked based on their general attractiveness, market size, and growth rate. The study provides a crucial view on the full body scanner market by segmenting the market based on technology, systems, application, and regions. All the technology, systems, application and regional segments of full body scanner market have been analyzed based on present and future trends and the market is estimated from 2015 to 2023. Technology segment includes image processing & modelling, and 3D body scanner and the systems segment consist of millimetre and backscatter. Further, on the basis of application, the market for full body scanner is segmented into transport and critical infrastructure. The market is analyzed based on five regions namely North America, Europe, Asia-Pacific, Latin America and the Middle East and Africa.